Before I go further and lay this out in SketchUp3D I thought id show you the lay of the land – I’ve rotated the 1899 map so Devonshire road houses are now at the bottom to match with wonderful aerial photo – those houses now face the rear of the multi storey car park for Priory Meadow shopping centre. It takes time to plan a virtual / digital 3D model of the demolished site .. but this is the imaginative part ! Queen Victoria (born 24 May 1819) and Prince Albert her husband (born 26 August 1819) would both be 200 in 2019. This could be marked in Hastings by an exciting new free public experience that will continue for many years to come. 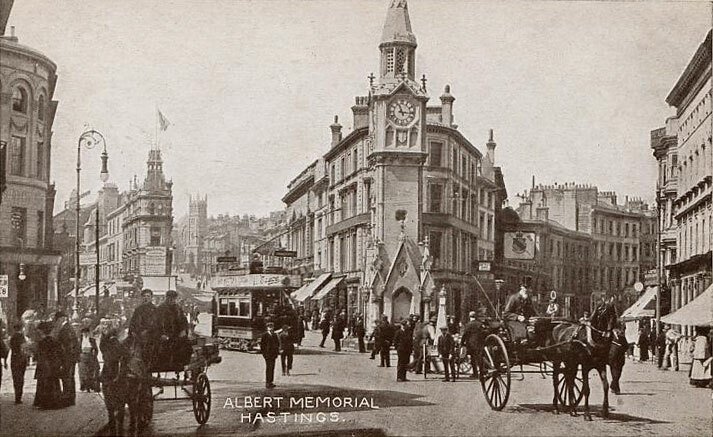 The Clocktower Memorial was erected with public money to commemorate Victoria’s beloved husband Prince Albert in 1862 in the town centre. The site chosen was where Victoria and Albert (then Prince and Princess of Wales) were addressed by the fishermen of the town in June 1882. This site was originally where the Priory Bridge crossed the Priory Stream. And now it is preserved as an Augmented Reality artwork which anyone with a smartphone can view (and hear) when they pass through town. You can download and start experiencing Apparitions right now if you are an iOS (Apple) user – iPad or iPhone.. of course we realise the demand for an identical Android version and that’s exactly what we are working on for 2019. 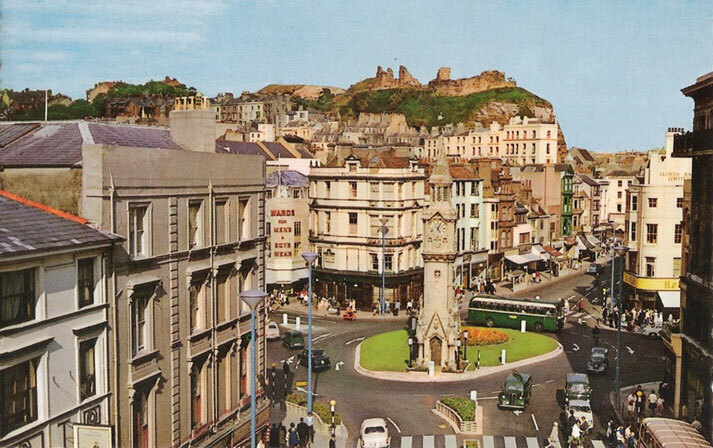 The Clocktower was demolished in 1973 and a mainly pedestrianised space remains with neither clock or any other method of replacement memorial to this public funded sculpture. Prince Albert’s statue luckily was protected for 50 years and reappeared late in 2017 outside HBC town hall. I propose ‘AR’ markers to trigger a select ‘Apparition’ using my app, once the additional costs for an identical build is achieved – so both Android and Apple Smartphones will enable the experience. The markers will need to be attached to bollards, railings or lampposts in the vicinity of each original location. Both of these have been identified as being in the HBC domain, so they would be able to choose a mounting place for small metal triggers, like laser engraved postcards with the instruction for location of free download for both platforms. What I discovered was how missed the cricket ground is, and this was voted as the next missing landmark to be preserved and augmented in an ‘Apparition’. In the Priory Meadow there is a statue of a cricketer, and I propose the 3D cricket grounds and buildings appear from around this stature as the embedded trigger. This would enable the lost landmarks to be experienced when visiting their original location. For a small extra cost 100,000 postcards could also be printed and available to collect from HBC tourist information, library, town hall and Stade which would enable anyone to download the app, and trigger the experience by viewing the postcard using their smartphone from wherever they are. So, as well as The original Hastings Cricket ground I would also like to make an Apparition of St Leonards Church which has had to close due to subsidence and The Amsterdammer shipwreck which is only accessible a few times each year when the tide is significantly out.